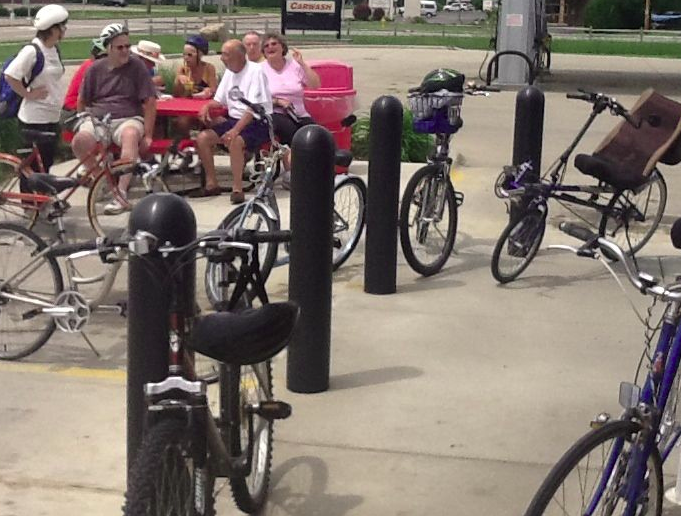 Ten Poky Pedalers shared Bike Fun at its purest on yesterday’s Ornamental Water Well Bell-Ringer Ride. Despite ominous weather forecasts, it actually turned into a rather nice afternoon. From Little Plover River Park, we rode an 8-mile loop through neighborhood streets of Plover. 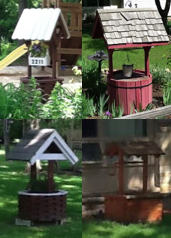 Each time we spotted an ornamental water well on someone’s front yard, we all enthusiastically yelled “water well” while gleefully ding-dinging our bike bells. Over 20 ornamental water wells were spotted on our tour. It’s no wonder that PPSP has named the water well as the Official Lawn Ornament of Plover. About halfway through the ride, we stopped at a convenience store to share water well stories and other conversation. If this sounds like a rather pointless ride, the truth is that is was. But that often leads to the most Bike Fun. All Poky Pedalers had a great time. There is still lots more Bike Fun to share with PPSP. Poky Pedalers can find out about July’s rides here. The full 2013 Bike Fun Calendar, with Poky Pedals scheduled into October, can be found here.